I watched this Korean drama Oh! My Lady (2010) directly after I watched a somewhat similar type story, 2008's The Last Scandal Of My Life; both were loosely focused on an arrogant actor becoming humbled through falling in love with his domestic employee. Except for that basic outline, however, the two stories were quite different: Oh! My Lady added an extra element of surprise: the arrogant actor is thrown out of his usual comfort zone by a woman who comes out of the woodwork and dumps a traumatized four year old mute child on his doorstep, claiming the little girl is his biological child and he needs to take care of her. She then heads for America, disappearing out of their lives for good. In Scandal the two leads had met as high school kids; in Lady they meet for the first time when the lead female is hired as a domestic by the actor and is the first one to care for the abandoned baby tossed into their lives. So in one show the couple are rebuilding a relationship, and in another they are beginning a new relationship that will permanently change both their lives. I tuned into this K-drama solely to watch actor - singer Siwon Choi (The King Of Dramas, Spring Waltz) in a leading role instead of just supporting; he always makes me smile and laugh. He has such an effervescent personality, on-screen and off, and he's known to be a good Christian type of guy who simply seems to love everyone. He's said publicly during interviews that when his career as an actor and singer ends he'd like to become a missionary. With his cheery disposition I'm sure he'd be a great one. Lead them to the Lord ... with LAUGHTER! I had no idea I would fall in love with this drama for its own sake, or burst into tears at one incredibly emotional scene that I will never forget! Siwon can be serious and a clown - I love him either way! However, I really had to force myself to warm to the leading lady in this show's first episode, actress Chae Rim (All About Eve), whose character just seemed so wild and directionless at first, giving her own biological child over to her annoying ex-husband to take care of, but then by the second episode we find out more details why she does that, and she further improved in my estimation when she takes pity on the abandoned child of her new employer and cares for her daily needs, physical and emotional. By episode three I actually liked her character MORE than Siwon's! This just goes to show you it's never wise to reject a show if the first episode doesn't quite appeal to you, for whatever reason. You could be throwing away a gem of a show if you stop watching too early in a K-drama. I ended up loving this one so much that I gave it an A grade. The writing was excellent and thoughtful, not just funny and slapstick. 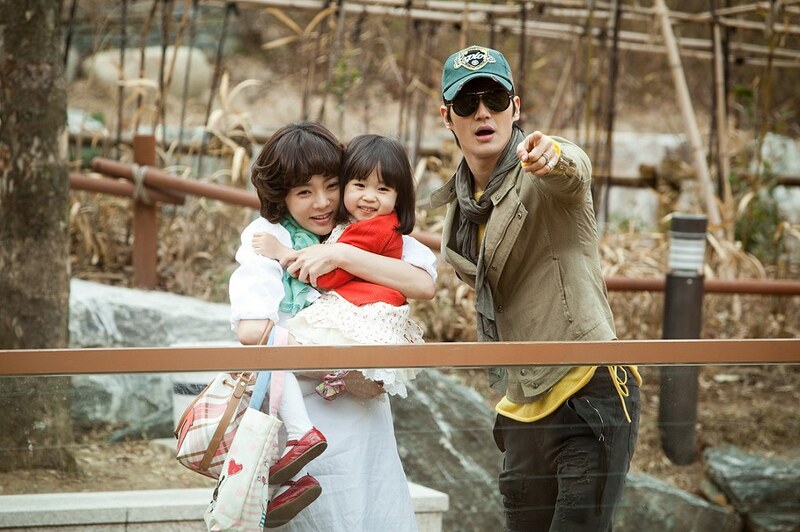 When Siwon was with the children in this drama I lost it, and totally melted into a puddle on the floor. He's going to be a great father some day. The Story: Sung Min Woo (Siwon Choi) is the top male film star in Korea due to his good looks and boyish personality. Ambitious to improve himself professionally, he moves into television dramas and brings them high ratings with his star power -- despite his rather terrible, hammy acting! He also has an exploitative, unethical manager Yun Sik Jang (Kim Hee Wan) who doesn't serve his interests well, and a slew of mediocre directors who can't seem to do anything with Min Woo to inspire him to act better. They're afraid to tell him he stinks because he's such a big star! When he runs to kiss his leading lady on screen, for example, he looks ridiculous, with inappropriate facial expressions and body language. Yet he stays popular and keeps getting hired because of his large and vocal fan clubs, filled with silly teen fan girls who go wild for him no matter where he goes or what he does. Yoon Gae Hwa (Chae Rim) is a housewife divorced from a rich and ludicrously narcissistic cheating husband named Byung Hak (Tae Woong Yoo) who got away with not having to give her alimony and child support because of Korea's absurd divorce laws which give automatic child custody to husbands, even if they've cheated! (You see this scenario even more brutally portrayed in the drama The Greatest Marriage). Gae Hwa needs to earn money fast in order to get any time with her own child, Min Ji (Bang Joon Seo). There's also an extra pressure to do this because she knows her ex and his new woman don't really want to be saddled with a minor child and will end up neglecting her. Gae Hwa's sole prior work experience before marriage was six months as a reporter for a weekly scandal rag. Her first odd jobs shown in the series are unsuccessful because of her inexperience, but they include one day as housekeeper / maid for famous actor Sung Min Woo.This leads to her being the first person at his apartment who sees a little mute girl named named Ye-eun (adorable child actress Yoo Bin Kim from The Princess' Man and God's Gift: 14 Days) who was dumped on his doorstep. She reads the note in the child's bag and discovers the girl is the actor's baby from an out of wedlock liaison five years earlier. When Min Woo discovers the child with Gae Hwa he is shocked and tries to get rid of both of them. "You take her!" he yells and tries to push them both out the front door! (How can there be any hope for this arrogant son of a gun to become a human being? Well, wait and see: it does happen, but slowly, bit by bit, so when the acceptance finally comes it means all that much more to the audience. Arrogant jerks do not become good guys overnight - and some never do!). How could anyone resist this adorable face??? Shortly afterwards, Gae Hwa earns a job at a musical production company, headed by handsome but reserved Si Joon Yu (Hyun Woo Lee), when she is told if she can get Min Woo to star in their planned theater musical that the full time job will be hers, with benefits. So desperate to get this job because it means she can win time with her own daughter, she blackmails Min Woo and hints she will go to the press and reveal the truth about his out of wedlock daughter if he doesn't sign the contract to appear in the musical. With no other choice he signs, earning him the ire of his unethical business manager, who swears to get even with the meddling maid and nanny to Min Woo's "bundle of joy". He doesn't want Min Woo anywhere near a theater stage because he is convinced it would be a disaster for his career since everyone but Min Woo himself knows he isn't a good actor. when the inevitable misunderstandings rear their ugly heads? Handling Min Woo at work as well as at home is no easy task for Gae Hwa, due to their initial mutual antagonism, spurred on by Min Woo's immaturity. However, everyone is under-estimating Min Woo. He finally begins to change. It seems he has a touch of humanism at his core after all. Gae Hwa comes home from work to stay at his luxury apartment and take care of him and his daughter, and the domestic bliss proves to be good for him. He starts to really apply himself to the musical and works extremely hard learning to dance, sing, and act. Through both their efforts to reach out to one another and calm a turbulent storm, Gae Hwa starts to respect Min Woo more, and he also begins to appreciate her efforts for him and his daughter, for her jobs are not over when she comes home from the office: she has to cook, clean, do laundry, read bedtime stories, etc. During the day the little girl spends time with Gae Hwa's best friend, a psychiatrist named Bok-nim Lee (Seo Jin Yu), who tries to draw the little girl out of herself so she can finally speak again -- there's nothing organically wrong with the child, it's purely psychological. For the first time Min Woo begins to take an active interest in the child and to realize she's been traumatized in the past and needs parents to love her. When a box of baby records arrives from America from the abandoning mother, he pours over the papers and tears up looking at her baby pictures. He spends more time with his daughter, taking her to the zoo, for instance, although this runs the risk of the paparazzi putting two and two together about his secrets, especially with a two-bit rag reporter named Min Kwak Han (Kwang Kyu Kim) constantly at his heels tracking his every move and taking pictures. Gae Hwa's good example in caring for a child who is not even her own biological child causes Min Woo to gain maturity very quickly as he learns to accept and love his daughter and becomes something unexpected in the process - a good actor. He also starts to fall in love with Gae Hwa, especially when he sees her divorcing employer spending quality time with her, enjoying her company because his wife Jung Ah Han (Jung Hee Moon) has cheated on him and broken his heart. Jealousy rears its ugly head in Min Woo's heart and causes him to start to ignore a crush he had had on an actress Yu Ra Hong (Han Byul Park). The neglected crush tries to worm her way back into his affections and takes his little daughter shopping -- however, she loses track of the little girl in the store and everyone runs frantically around the store trying to find her, panic-stricken since she is mute so she cannot speak up for herself. Time is of the essence. And then comes the moment that made me burst into tears because it was so unexpected and touching. Little Ye-eun is walking by herself, lost, and then sees a big giant cardboard cut out of her father the star. She stops walking, takes the cardboard hand of her "father" and looks up at his "face". She isn't going to move from this spot and Min Woo turns a corner and sees her there holding his "hand". I sobbed for three minutes and my daughter had to come over and pat me on the shoulders. "These damn Korean writers" I said through my tears. "Only they can do something like this to me." Will the paparazzi find out the truth about Min Woo's domestic life? If so, will the coverage destroy his career? What about the success of the musical? Will the financial backers pull out their support if a scandal erupts? What about Min Woo's trust and love for Gae Hwa? Will a scandal destroy that too? Will Gae Hwa lose her job and any chance to win back custody of her own daughter? Is there any chance they can be together as a family? Don't miss this heart-warming show especially if you are a fan of Siwon or Chae Rim. It's terrific. I love dramas where you see people growing stronger as human beings, less selfish, more sacrificial and giving toward one another. Siwon was amazing, such an under-appreciated actor. Chae Rim at first annoyed me but quickly won me over with her sincerity in playing this difficult "ahjumma" (older woman) role. Her love for a child that wasn't even her own child was beautiful and inspiring. Also enjoyed the secondary characters and the music. Oh! My Lady is a crowd-pleaser and a winner.